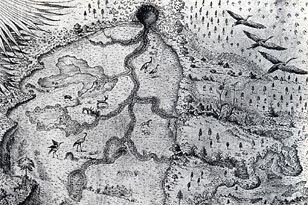 Detail from William Bartram's idiosyncratic drawing of "The Great Alachua Swamp." American Philosophical Society. "The extensive Alachua savannah .... [is] covered with waving forests and fragrant Orange groves, rising from an exuberantly fertile soil .... At the same time are seen innumerable droves of cattle .... [h]erds of sprightly deer, squadrons of the beautiful, fleet Seminole horse, flocks of turkeys, civilized communities of the sonorous, watchful crane, mixed together, appearing happy and contented in their enjoyment of peace, 'til disturbed and affrighted by the warrior or man."